Senior Sadie Willborn scored a career-high 16 points to lead the Belmont girls to their first win of the season Saturday against Juda. 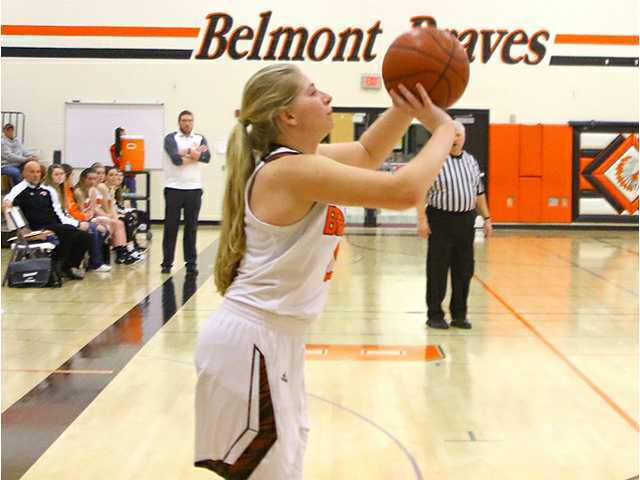 POSTED January 31, 2019 10:35 a.m.
BELMONT — Belmont senior Sadie Willborn was happy to lend a helping hand to end the Lady Braves’ 14-game losing streak. And, it was a hot hand. Willborn scored 14 of her career-high 16 points in the first half to lift Belmont out to a 16-point halftime lead over visiting Juda, and the Braves’ defense took over from there holding the Lady Panthers to just 10 second-half points to earn a 52–28 non-conference victory at BHS on Saturday, Jan. 26. Not only was it the first win of the season for the Lady Braves (1–13 overall), it also helped avenge a 16-point loss to the Panthers that took place a year to the day ago. The Panthers (2–14) grabbed an early 3–0 lead on a three-point play by senior forward Hannah Powers, but the Braves fought back with nine unanswered points to overtake their guests and they kept pouring it on from there. Willborn buried all four of her 3-pointers in the opening half to lead the Braves out to a 34–18 halftime advantage. Senior Abby Althaus and sophomore Kylie Crapp each added a trey as the hosts sank six shots from beyond the arc en route to a 16-point lead. “We came out strong. Our shooters were hitting shots in the first half and that always helps open things up inside. We’ve known that Sadie and Abby can do that. It was nice to see them do it tonight,” Seabrooke commented. Belmont also used its press to make the Panthers uncomfortable when they had the ball, which led to a bevy of turnovers. The Braves’ D continued to stymie the Panthers’ offense in the second half. “The press helped us. It’s something we’ve been able to use it off and on against certain teams. We ran it well tonight. It’s not something we can run all the time against everybody, but tonight it was a good step in the right direction,” remarked Seabrooke. Belmont opened the second half with a 14–2 run to build up an insurmountable 48–22 cushion. Freshman Ashley Freeman netted 10 points for the Braves, while Althaus and senior Elsie de Haan chipped in with eight points apiece in the win. At Belmont, on Thursday, Jan. 24, freshman Katelynn Esser scored 16 of her game-high 23 points in the first half to lead Highland out to a 33–22 halftime lead, and the Cardinals were able to hold off the Lady Braves’ second-half comeback bid to snap a nine-game losing streak to Belmont with a 57–51 Six Rivers West victory. The Cardinals (6–11, 2–4) went 20-for-30 from the foul line to sink the Braves, who converted just 8-of-19 free throw attempts. Esser went 13-for-16 from the line in the game to lead the guests. Freeman tallied a season-high 15 points to pace Belmont. Althaus followed with 14 points, while senior Nicole Knebel scored seven points and Willborn added six for the Braves. Junior Carlee Kosharek and freshman Meg Tarrell scored 10 points apiece to aid the Highland attack. The Braves’ non-conference game against Warren (Ill.) was called off due to weather on Tuesday, Jan. 22, and will not be made up this season. Belmont heads to Highland for a rematch on Friday, Feb. 1, and then has non-conference games against Monticello (8≠7) at home in the elementary school gym on Monday, Feb. 4, beginning with the JV game at 6 p.m and against Pecatonica (8–13) at Blanchardville on Tuesday, Feb, 5, with a varsity-only game starting at 7 p.m.
Juda – Powers 13, Steinmann 4, P. Price 3, R. Price 8. Totals – 11 5-9 28. Belmont – Abby Althaus 8, Elsie de Haan 8, Nicole Knebel 4, Callie Wiegel 2, Sadie Willborn 16, Ashley Freeman 10, Kylie Crapp 4. Totals – 0 0-0 0. 3-point goals – J 1 (P. Price 1), B 6 (Althaus 1, Willborn 4, Crapp 1). Total fouls – J 13, B 14. Fouled out– none. Highland – Tarrell 10, Esser 23, C. Kosharek 10, K. Mueller 6, Drury 8. Totals – 18 20-30 57. Belmont – Abby Althaus 14, Elsie de Haan 1, Hailey Layer 2, Nicole Knebel 7, Callie Wiegel 2, Sadie Willborn 6, Ashley Freeman 15, Kylie Crapp 4. Totals – 19 8-19 51. 3-point goals – H 1 (Tarrell 1), B 5 (Althaus 3, Willborn 2). Total fouls – H 18, B 24. Fouled out– H: Kosharek.